"When Bad Girls Go Good"
Wally and his police colleagues are chatting about Giganta and her recent strange behavior. For one reason or another she's fighting crime! 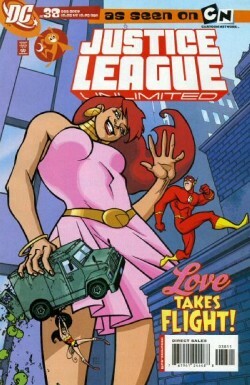 Giganta is searching for someone in Central City and so far having no luck. Growing to enormous size she swings a construction crane and leaves a civilian clinging on for dear life. Fixing her make up she lies sensuously on a skyscraper. Wally overhears and watches the other police racing to the roof access to see Giganta in action. Fast as lightning he races out as the Flash and with ease rescues the poor construction worker. Giganta is keen to renew acquaintance with Flash after their brief flirtation when the JLU had to team up with the Legion to fight off Darkseid. Giganta chickens out and thunders through Central City in tears. When Flash overtakes her he asks her what's going on and misreads the signals. He assumes she wants to learn how to be a hero and be his sidekick! Flash's romance with Linda Parks takes a back seat to his super career as a duo with Giganta and she watches on jealously as they take down villains such as the Top, Mirror Master and Weather Wizard. Though heroism doesn't come easy and her size and quick temper make her more a liability than an asset. Even though Wally can't read signals, Linda can. She quietly asks Wally if Flash and Giganta are an item. Flash is shocked and vehemently denies it. So much so that Giganta overhears and is devastated. Fire, Wonder Woman and Green Arrow are chilling out in the Watchtower when Mr Terrific interrupts and orders Diana to aid Wally. She rushes to action but in the meantime Giganta has captured Wally and Linda. The truth dawns on Wally and he realizes he's romantically between two women! When Giganta realizes he only has eyes for Linda she goes on a rampage. Wonder Woman arrives and is promptly swatted. Wally lures his prospective girlfriend out of the city and traps her in a sonic boom until she's knocked down by the momentum. Flash then uses Diana's lasso to bind Giganta till she can be taken back to Gorilla City. Even after all the shenanigans Giganta still lusts after Flash but Linda puts a stop to that! Giganta may be bigger and able to hold Flash in her hand but Linda is the one who picked him up! Story - 3: An interesting twist that actually follows the show's continuity, Giganta proving there's more to her than being a giant. Flash is a little too dumb and the story could have been an "Adventures in the DCU" for all the involvement of the JLU. It would have been nice if the façade had lead to Giganta being on the Satellite or in the Tower interacting with heroes she previously fought. Wonder Woman was wasted and I hope it's not the start of solo adventures, the rotating roster works best. Art - 5: Nice to see a Leaguer out of costume, great clean artwork and very much reminiscent of the show. It's rare to see a variety of perspectives and considering the varying heights of the cast it's undertaken well. Cover Art - 3: Looks of the Timmverse buts comes across as a bit weird... Wonder Woman looks like a rag doll and Giganta looks like she has had a punch in the nose. I appreciate Bruce Timm's style is very difficult to emulate at times and so for overall compostion it gets a mid rating.